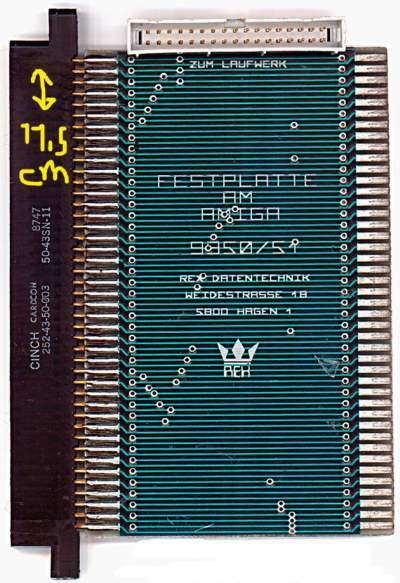 The 11.5cm board connects to the side expansion slot of the A500. The connector at the other end is a pass through for connecting additional expansions. On the side of the board is a 34pin connector. 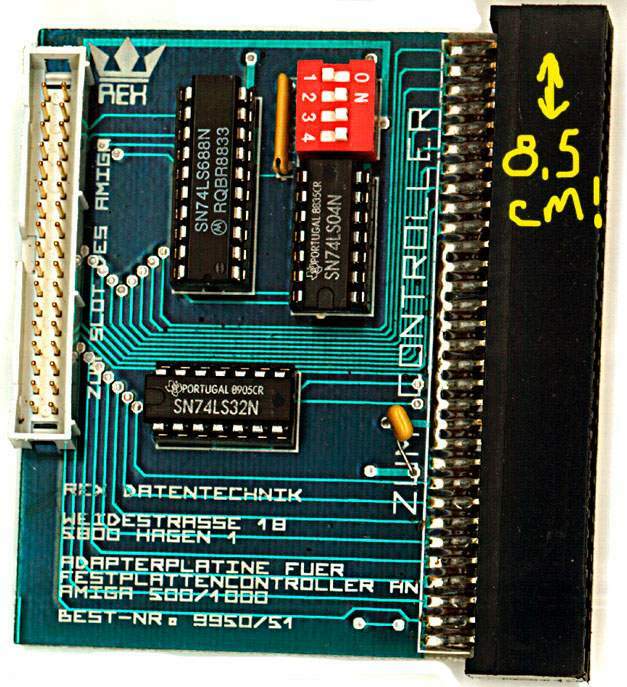 The second board with an 8.5 cm long connector, it is labeled "Zum Controller", on the other end is the same 34-Pin connector as on the first board, that is labeled "Zum Slot des Amiga" There are three 'SN'-ICs and a 4-Pin DIP-Swich on the board. This is a controller so that you could as an 8bit ISA card MFM/ST506/ST412 harddrive controller. It is not entirely clear how this is rigged up but the general idea seems to be that the 11.5cm long board connects to the side expansion slot of the A500 and the 34pin connectors of both cards are linked together via a 34pin ribbon cable. The 8bit ISA card, then connects into the edge connector of the 8.5cm board. Page contributors: Georg Fuchs, Martin Nemec.